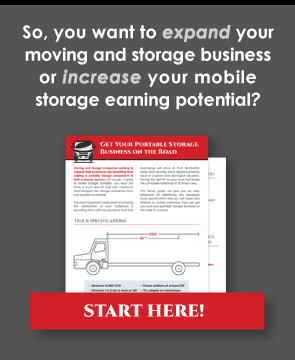 Does Your Moving Equipment Match Your Goals? Building a business is one of the most difficult tasks you can ever undertake. It requires planning, preparation, and most importantly, the tools needed to get the job done right. As you go through the planning and preparation phases, it’s crucial that you assemble the right tools and moving equipment to meet the needs of your customers and your operational goals. Your personnel should always be a top priority. They must be your strongest and most reliable tool. Not only are they the face of your business to your clients, but they are the ones who will step in and step up when things need to get done. As you expand your operations, make sure that you make training your personnel and honing their skills a priority as this can pay significant dividends as the business grows. When buying trucks, always consider the size of your containers and their max load weight. Your trucks should be fitted with a lift system that is capable of safely lifting the container when it is fully loaded. Moreover, it is important to have an adequate number of trucks to meet your planned operational goals. The right number is highly dependent on the size of the area you plan to service and the size of the population you can expect to purchase your moving services. You should plan on purchasing between 20-50 containers to get started. However, you can scale this and start off slow and build up to your desired inventory as the business expands. If you choose this route, be certain that you know the build and delivery times for new containers so that you won’t be left in a lurch if you get a sudden rush of clients. One of the most important pieces of moving equipment does nothing more than managing bits and bytes of data. Your computers should be reliable and loaded with easy to use and update inventory management software. Moreover, your computers and documents should be connected to mobile devices and cloud service providers so that you have full access to data whenever you may need it. 21st-century business starts on the Internet, and your business needs a solid website that potential customers can visit to learn about your services and that existing customers can use to manage their account. A website isn’t just a novelty; it is a solid piece of moving equipment that can move mountains of business through your front door. You should get in the habit of assigning small benchmarks to reach along the way. This makes it easier to track your progress towards your goals. It also makes the process a little less daunting and nerve-wracking because it makes it possible to make gradual adjustments and shifts along the way, which are easier to manage and implement. Setting monthly, quarterly, and annual goals is the best way to ensure that you have the right moving equipment at the right time. Not only will this save you money on overhead, but it will ensure that you don’t grow too fast that the quality of your services suffers. This is critical as if you “grow too big for your britches” and your services begin to slack off, then your reputation will tarnish and that can take years to recover from.